Name: Alive After Five hosted by R&K Distributors, Inc. 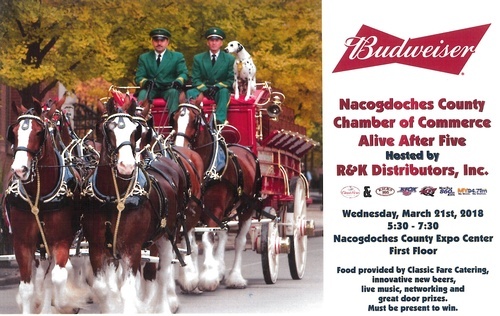 The Chamber s Alive After Five hosted by R K Distributors, Inc. is 5:30 to 7:30 p.m., Wednesday, March 20 at the Nacogdoches County Exposition Civic Center. Scott Goodrich at R K Distributors has promised another business-after-hours event that won t disappoint with delicious food catered by Classic Fare and entertainment by Townsquare Media. Guests will have chances to win cool door prizes and a lucky Chamber member may win a $700 cash prize, but you must be present to win!